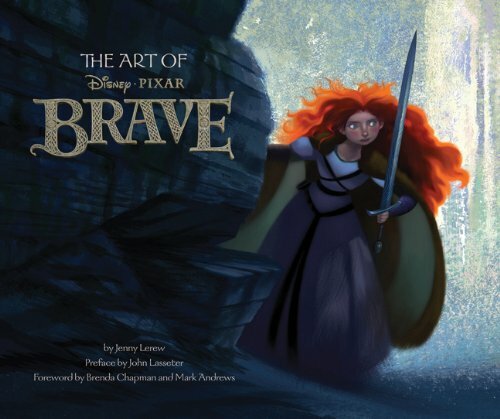 This is a lovely art book for the movie Brave. This is number 13 for Pixar if anyone's counting. The book's 160 pages and it's all filled with art and commentary. The concept art is great and you can really feel that everything really fits well together, the characters, the landscape and the stories. There are character designs, environment drawings, sculpts, storyboards and colorscript. This is Pixar's first period film. The environment designs are a bit dark but that's because the movie is set in ancient Scotland. It's interesting to see a mythical and worn landscape as designed for animation. The colour choices are quite muted, perhaps to give more contrast to Merida. The characters and art are delightful to look at. They are so full of personality. They have all sorts of characteristics and shapes that make them stand out. There are a few pages of storyboard sequences that are really great, even without words you know the chemistry between the characters and how they are feeling. Steve Pilcher is the production designer and there's a lot of his charming drawings included. His pencil drawings really beautiful and dimensional. They really bring the characters and places to life. Other artists included are Carter Goodrich, Steve Purcell, Noah Klocek, Matt Nolte and more. The book doesn't really talk about the story as a whole, but the text do cover the characters and their development. So there's bits and pieces of spoilers throughout. Overall, it's a wonderful book put together by author Jenny Lerew. It's a good read with great art. Highly recommended for fans of Pixar and animation art. Below are some pictures from the book. I've filtered out all the spoiler parts except for the video. The whole video is a spoiler, so you'll want to skip that if you don't want spoilers. This looks magnificent! Can't wait for this book. I was wondering if there is a book on more of Carter Goodrich's work? I don't remember him having a dedicated book. His work is always shown in small amount in varies movie art books. Sorry for posting here but I've realised that a lot of pixar art books have a lot of character designs having the cartoon style. Could you give me 2 or 3 highly recommended books on catooning and also 2 or 3 books on storyboarding. Sorry for posting here but I've realised that most pixar art books have a lot of cartoon styles like powerpuff girls and stuff in their character designs. You might want to try Creating Characters with Personality and Character Mentor, both by Tom Bancroft. They are both beginner books to character design. As for storyboarding books, get Framed Ink. Another good one is Directing the Story. Framed Ink seems to be out of print. You can order from Design Studio Press and see what happens. I just wanted to note that "Framed Ink: Drawing and Composition for Visual Storytellers" is back in print again and can be bought on Amazon! Great review, as always, Parka!